The Falcons are the underdog rookies. After all, this is the ninth Super Bowl for the Patriots. With quarterback Tom Brady and his magic necklace fending off the Falcon defense, it will be Brady’s fifth Super Bowl win if his team secures the glory. The game begins at 6:30 ET and over 100 million folks will be watching. Since Super Bowls tend to last 3 1/2 hours, I’m guessing Lady Gaga should be hitting the stage around 8:15. 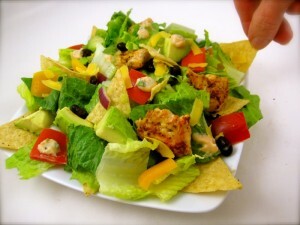 Tossed salad with a nacho crunch is a refreshing option. Lady Gaga’s name was inspired by the Queen song, ‘Radio Gaga’. Her real name is Stefani Joanne Angelina Germanotta, and her nicknames are Gagaloo, Loopy, Mother Monster, Little Monster and Rabbit Teeth. She’s been wanting to sing at the Super Bowl since she was four years old.